Hot weather and high altitude are less than ideal environments for any aircraft. In standard conditions, true altitude (above sea level) = density altitude. However, if temperature increases the density altitude goes up (the air becomes less dense), and the aircraft will feel it is at a higher altitude. 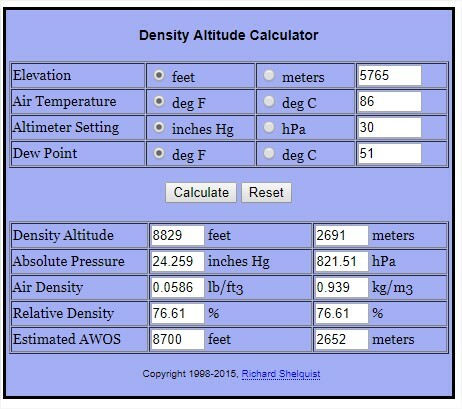 If the location where you are flying is at a high altitude over mean sea level and there’s hot weather, use a Density Altitude calculator to determine whether or it is safe to fly the aircraft. Determine the altitude or elevation over mean sea level. Altimeter settings (in inches of Mercury), to keep things simple we will set it at 30. Investing time on determining the correct number can give us variations only of a couple hundreds of feet, so it is less relevant. Contact success services to learn about the maximum density altitudes compatible with 3DR and DJI drones. Watch out for the battery percentage. The vehicle will require more energy to generate the thrust needed to fly. Survey small sites and always keep in line of sight of the vehicle. Preferably, avoid losing connection between the drone and controller; aim the controller towards the vehicle at all times. Go here for more information on range. Vehicle entering into Vortex Ring State while descending. It is likely that the vehicle will enter in this state while landing. You will notice by an uncontrollable descending. Continue the landing manually. When close to the ground, throttle down to 25% until it reaches the ground then go to 0% and keep throttling down until the motors had stopped. If you have additional question, contact your Success Services Engineer for additional information and tips.